These days one thing most of us will have is a computer. They are probably just as common a household possession to many people as a TV set is nowadays and whether you use it partly for work, to play games on, to listen to music, to do your banking or shopping on, to store photos on, to keep in touch with people or just to do some research now and again, it is a valuable commodity in more ways than one. And, if you are moving home, you’ll want to ensure that your computer moves safely with you and, unlike other items, there are 2 aspects you need to consider when moving a computer. Firstly, you need to look at ensuring it’s transported safely and doesn’t get damaged and, secondly, you’ll also want to make sure that what’s contained on the computer itself isn’t lost or damaged either. If you’re using a removal company, they are usually the best qualified people to pack away a computer safely to transport it from one house to another. However, if you’re packing it away yourself, you should, where possible, try to pack it in the original box and packaging in which you bought it. If you’ve not kept that, make sure you use an alternative sturdy box for the keyboard and monitor which is large enough to stuff padding around the computer inside the box. 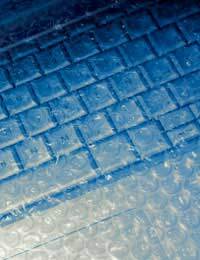 Plastic bubble wrap is usually the best material to use to give it extra padding for protection. If it’s a PC as opposed to a laptop, the central processing unit (CPU), or the ‘tower’ as it’s often referred to, is even more important than the monitor so ensure that the box and padding you use for this is also adequate. The same goes if you have an external disk drive as, just like the CPU, this is where you’ll have stored many of your valuable files. As for moving a printer, you should refer to your user manual as different types of printer require different preparation for moving. Most of you may have already got insurance cover for your PC as part of your home contents insurance but you may be surprised to know that some policies only cover it against theft or damage inside the home and that the cover may not include your PC when it’s outside the house. If you’re unsure, it’s worth checking and if you find that you’re not covered by removal, it’s important that you establish the cost of the PC and all its peripherals and that you take out the relevant protection cover from the removal company in the event of loss or damage en route to your new home. Upon reaching your destination, make sure you check and mark off the items as they’re unloaded. Also ensure that you let the PC and all its peripheral equipment adjust to room temperature for a few hours or even overnight before you use it as condensation can build up during transit, especially if it’s very cold, and if you try to use it before this has fully evaporated, you may end up damaging your computer beyond repair. If you’re not an expert at connecting up a computer, make sure that you label all the leads and that you know which lead is used to connect each piece of equipment and how it all fits together. Also, make sure you dig out your user manual so that you don’t end up putting it all back together incorrectly which might also damage it. Make sure any disks are removed from the computer before packing it away too. You’re unlikely to have any problems with files or programs on your PC being damaged in any way whilst in transit as, hopefully, your PC won’t be dropped during the move but accidents can and do happen so it’s advisable to back up any important files on an external hard drive or a memory stick so that you have copies. Also, make sure that all the boxes containing your PC, its peripheral equipment and all the add-on equipment like disks, CD-Roms etc are packaged safely into boxes clearly marked ‘Fragile’. In fact, if you are driving a car to your new home and you have sufficient room, it’s often better to take your PC with you rather than leaving it to the removal men. That said, don’t be tempted to do that if you are staying overnight anywhere en route to your new home unless you’re prepared to take the PC and equipment out of the car and into the hotel or other accommodation with you as you don’t want to become the victim of theft.